Lake Erie is the tenth largest lake on Earth  and, of the five Great Lakes of North America, it is the fourth largest by surface area, the southernmost, shallowest, and smallest by volume. It is bounded on the north by the Canadian province of Ontario, on the south by the U.S. states of Ohio, Pennsylvania, and New York, and on the west by the state of Michigan. 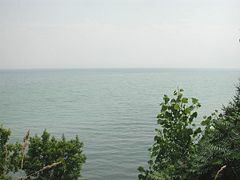 The lake is named after the Erie tribe of Native Americans who lived along its southern shore before being exterminated for aiding the Hurons, the enemy of the Iroquois League. The Lake creates a favorable agricultural microenvironment in the bordering areas of Ontario, Ohio, Pennsylvania, and New York. In addition, its waters are home to numerous fish species, making it a popular site for commercial fishing. However, since high levels of pollution were revealed in the 1960s and 1970s, there has been continued debate over the feasibility of commercial fishing and measures used to protect the lake. The fragility of the Great Lakes is only recently understood and studies and measures have been undertaken to properly manage this complex ecosystem, which suffered tremendously in the 19th and 20th centuries due to pollution and misuse. Lake Erie (42°30'N, 81°00'W) has a mean elevation of 571 feet (174 m)  above sea level. It has a surface area of 9,940 square miles (25,745 km²)  with a length of 241 miles (388 km) and breadth of 57 miles (92 km) at its widest points. It is the shallowest of the Great Lakes with an average depth of 62 feet (19 m) and with a maximum depth of 210 feet (64 m). The western one-fourth of the lake is shallower, with an average depth of 42 feet (13 m) and a maximum depth of 62 feet (19 m). For comparison, Lake Superior has an average depth of 483 feet (147 m), a volume of 2,900 cubic miles (12,100 km³) and shoreline of 2,726 miles (4385 km). Lake Erie is primarily fed by the Detroit River from Lake St. Clair, which itself drains Lake Huron, via the St. Clair River, and drains via the Niagara River and Niagara Falls into Lake Ontario. Navigation downstream is provided by the Welland Canal, part of the Saint Lawrence Seaway. Other major tributaries of Lake Erie include the Grand River, the River Raisin, the Huron River, the Maumee River, the Sandusky River and the Cuyahoga River. The U.S. states of Ohio, Pennsylvania, and New York are located to the south of Lake Erie; Michigan lies to the west, and the Canadian province of Ontario lies to the north. Point Pelee National Park, the southernmost point of the Canadian mainland, is located on a peninsula extending into the lake. Several islands in the western end of the lake belong to Ohio. 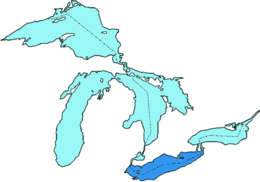 Pelee Island and 8 other islands are part of Ontario. The cities of Buffalo, New York; Erie, Pennsylvania; Toledo, Ohio; Port Stanley, Ontario; Monroe, Michigan; and Cleveland, Ohio are located on the shores of Lake Erie. It was the last of the Great Lakes discovered by French explorers, who had followed rivers out of Lake Ontario and portaged into Lake Huron. Before European contact, there were several Native American tribes which lived along the shores of Lake Erie. The Erie tribe (from whom the lake takes its name) lived along the southern edge while the Neutrals (also known as Attawandaron) lived along the northern shore. Both tribes were conquered and exterminated during the Beaver Wars in 1655 by the Iroquois confederacy. For many years following that war, the land around Lake Erie remained uninhabited and was used by the Iroquois as a hunting ground until the waning of the their power around 1700. About that time, several other Native American tribes moved into the empty land, namely the Ottawa, Ojibwe, Wyandot, and Mingo tribes. In 1669, the Frenchman Louis Jolliet was the first documented European to sight Lake Erie, although there is speculation that Etienne Brule may have come across it in 1615. Lake Erie was the last of the Great Lakes to be explored by Europeans, since the Iroquois who occupied the Niagara River area were in conflict with the French, and they did not allow explorers or traders to pass through. In the early nineteenth century, the U.S. was expanding westward, and Lake Erie was the crucial gateway through the Great Lakes to the new territory. During the War of 1812, the fledgling U.S. and Great Britain fought on many fronts. One of the most critical was Lake Erie; whoever controlled Lake Erie would control access to the land and resources of the new western territory. In the spring of 1813, Commodore Oliver Hazard Perry arrived at Erie, Pennsylvania, and oversaw the construction of a fleet of nine ships. By August they were ready to meet the British flotilla of six ships, led by Commander Robert H. Barclay, in the western part of the lake. The Battle of Lake Erie was fought on September 10, 1813 in Lake Erie off the coast of Ohio. The nine U. S. Navy vessels defeated and captured six vessels of Great Britain’s Royal Navy. This ensured American control of the Lake for the remainder of the war, which in turn allowed the Americans to recover Detroit and win the Battle of the Thames in order to break the Indian confederation of Tecumseh, the famous Shawnee leader. The victory secured Lake Erie, and the western territories, and guaranteed the admission of Ohio and Michigan to the U.S. It was in reporting back to his commanding officer, General, and later U.S. President, William Henry Harrison, that Perry offered the memorable summation, "We have met the enemy and they are ours." The victory earned Perry the nickname, "Hero of Lake Erie." The Erie Canal, one of the most ambitious engineering projects of the time, was begun in 1817. Beginning in Buffalo, New York, on the northeastern shore of Lake Erie, the canal would eventually stretch to Albany, New York and from there, on to the Hudson River, linking the new territories to New York City. Built at an unheard of cost of US$8 million (in 1818 dollars), by mostly Irish immigrant laborers, the project was financed entirely by the New York state legislature. In 1825, the finished canal was 40 feet wide and four feet deep and ran for 363 miles. To accommodate the rise in elevation from the Hudson River to Lake Erie of nearly 570 feet, 83 locks and 18 aqueducts were constructed. The canal was improved and expanded over the next 180 years, ultimately becoming a major barge canal and renamed the New York State Barge Canal, reaching a width of 150 feet, a depth of 12 feet and a length of 340 miles. Immortalized in folklore and folk songs, the success of the Erie Canal led to two decades of canal building, ending only with the emergence of the railroads, which soon surpassed canals in the movement of goods and people. Lake Erie infamously became very polluted in the 1960s and 1970s, due both to industrial and agricultural sources. Despite this, and perhaps unadvisedly, both sport and commercial fishing have continued without interruption to the present day. Pollution in the lake did not get much attention until the great Cuyahoga River Fire in June of 1969. Pollution from Cleveland and other Ohio cities had so contaminated this tributary of Lake Erie with petrochemicals that it actually caught on fire. The fire embarrassed state officials and prompted the U. S. Congress to pass the Clean Water Act. The lake also creates microclimates that are important to agriculture. Along its north shore is one of the richest areas of Canada's fruit and vegetable production, and the southeastern shores in Ohio, Pennsylvania, and New York are important grape growing regions, as are the islands in the lake. During the 1960s and 1970s, Lake Erie experienced changes in water quality associated with increasing levels of the nutrient phosphorus, chiefly from wastewater and agricultural drainage, in the water and bottom sediments. This resulted in eutrophication leading to algal blooms and major changes in productivity. The decomposition of algae led to extensive seasonal anoxic areas in the lake (the so-called dead zones), that were expanding rapidly in the early 1970s. The decomposing algal masses and associated fish kills fouled shorelines, contributing to the widespread impression of Lake Erie as a dead lake. The lake ecosystem is much changed from its original state, with a long list of well-established invasive species. Common fish species such as rainbow smelt, alewife, white perch, and common carp have all been introduced from outside the Great Lakes. Non-native sportfish such as rainbow trout and brown trout continue to be stocked for anglers to catch. Attempts to stock the lake with Coho Salmon were made, but failed, and that species is once again nearly absent from the lake. Recent invaders, zebra and quagga mussels have populated the entire Lake Erie ecosystem, shifting the food web and its resultant energy flow away from the pelagic zone and into the benthic zone. Other invasive species, such as the goby (recently arrived) and the grass carp (on the doorstep), have increased public debate about the risks of non-native invaders to Great Lakes ecosystems. Lake Erie is home to one of the world's largest freshwater commercial fisheries. Once a mainstay of communities around the lake, commercial fishing is now predominantly based in Canadian communities, with a much smaller fishery, largely restricted to yellow perch, in Ohio. The Ontario fishery is one of the most intensively managed in the world. One of the first fisheries in the world managed on individual transferable quotas (ITQs), it features mandatory daily catch reporting and intensive auditing of the catch reporting system. Commercial catch is dominated by yellow perch and walleye, with substantial quantities of rainbow smelt and white bass also taken. Anglers target walleye and yellow perch, with some effort directed to rainbow trout. A variety of other species are taken in smaller quantities by both commercial and sport fleets. The underlying issues are universal wherever sport and commercial fishing coexist, but their persistence in the Lake Erie context, one of the most intensively scrutinized and managed fisheries anywhere, suggests that these conflicts are cultural, not scientific, and therefore not resolvable by reference to ecological data. These debates are largely driven by social, political and economic issues, not ecology . Like the rest of the Great Lakes, Erie's levels fluctuate with the season of the year, with the lowest levels in January and February, and the highest in June or July. Its average yearly levels also vary depending on long-term precipitation variations, with levels falling during droughts and rising during periods of extended above-average precipitation. Lake Erie's short-term level changes are often subject to weather, since its shallowness and the southwest-to-northeast alignment of its longitudinal axis make it particularly prone to seiches (oscillating waves), especially during high southwesterly winds, when the lake water tends to pile up at one end of the lake. This can lead to large storm surges, potentially causing damage onshore. During one storm in November 2003, the water level at Buffalo rose by 7 feet (2.1 m) with waves of 10-15 feet (3-4.5 m) on top of that, for a cumulative rise of as much as 22 feet (6.7 m). Meanwhile, Toledo, Ohio at the western end of the lake will measure similar drops in water level. After the storm event, the water will slowly slosh back and forth, similar to the effect in a bath tub, until equilibrium is re-established. ↑ Factmonster.com. Large Lakes of the World. Retrieved July 25, 2007. ↑ National Park Service. The Battle of Lake Erie. Retrieved July 25, 2007. ↑ New York States Canals. The Erie Canal: A Brief History, Retrieved July 25, 2007. ↑ Chris Cappella. October 1, 2003. Answers: 10 snowiest 'cities' aren't all in New York, USATODAY.com. Retrieved July 25, 2007. ↑ the Straight Dope Science Advisory Board. What's the physics behind "lake effect snow"?, Retrieved July 25, 2007. ↑ Michigan Department of Natural Resources. Recovery of Lake Erie Walleye a Success Story. Retrieved July 25, 2007. ↑ U.S. Environmental Protection Agency. Lake Erie 'Dead Zone'. Retrieved July 25, 2007. ↑ ESPN. March 16, 2005. Smallmouth rich Lake Erie hosts pros, amateurs, Retrieved July 25, 2007. ↑ Kristen M. Szylvian, 2004. Transforming Lake Michigan into the 'World's Greatest Fishing Hole': The Environmental Politics of Michigan's Great Lakes Sport Fishing, 1965–1985, Environmental History. Retrieved July 25, 2007. ↑ F. Berkes, 1984. Competition between commercial and sport fishermen: an ecological analysis. Human Ecology 12: 413-429. ↑ U.S. Environmental Protection Agency. Great Lakes; Basic Information: Lake Erie, Retrieved July 25, 2007. Middle Bass Island. The Lake Erie Islands Directory. Middle Bass Island. 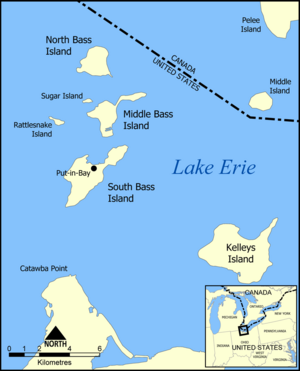 How many Islands are there in Lake Erie?. United States Enviornmental Protection Agency. Lake Erie. This page was last modified on 20 June 2018, at 14:30.